REI BOOKS IS WHERE THE PASSION FOR MODEL RAILROADING BEGINS. Model Railroading would not be the same without good quality books! It's the books that inspire us to build the layouts of our dreams. For many collectors and modelers it's the history of the real trains that make model railroading so interesting and enjoyable. For example, many modelers like the steam era so for those individuals there is nothing like looking through a good book on steam locomotives. I myself try to imagine what West Bahnhof (station) in Vienna was like in the early 1900's. I try to picture in my mind how the station looked at night with all the gas lanterns burning or how it smelled with all the burning coal from the locomotives. I picture the Orient Express leaving Vienna en route to Budapest. I also love looking at pictures from the turn of the century. I am amazed at how people dressed with all of their fancy clothes and luggage. This is what it's all about for me and nothing brings out the passion for trains like a good book. Railroading in my opinion is more than just the trains...it's the settings, history and innovations that make it the greatest hobby in the world. I think it is important to pay tribute to those amazing photographers who had the foresight to take pictures during the early days of steam and beyond. Reynauld's is proud to bring you our new REI BOOK section. 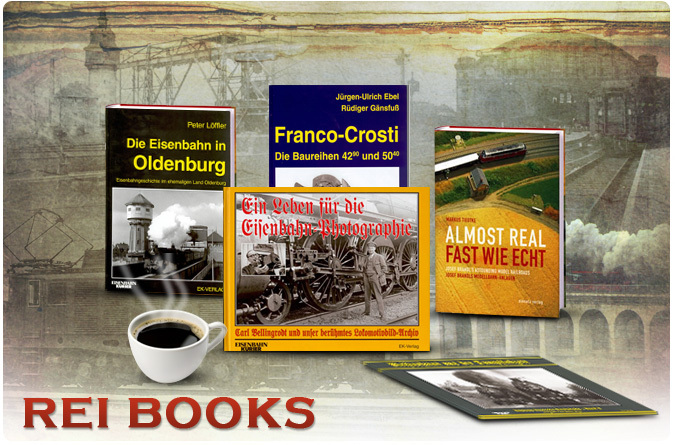 We will be adding hundreds of books over the next few months; which will cover all aspects of European Railroading. We hope you enjoy this new section on our website.